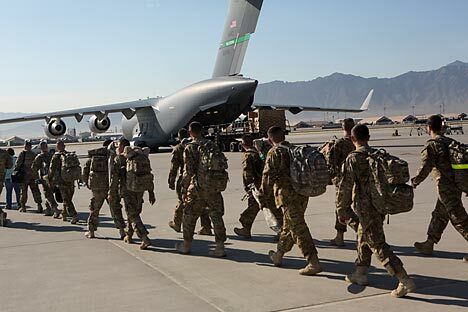 Russia has discontinued the transit of all military equipment and weapons to Afghanistan. A decree to this effect has been signed by Russian Prime Minister Dmitry Medvedev. The document, which was posted on the official legal information website on Monday, says the decision was made due to the expiration of the provisions of Resolution 1386 of the UN Security Council. The Russian Foreign Ministry has been ordered to "inform the governments of foreign countries and international organizations of the cancellation of ground and combined (by rail, automobile and air transport) transit through the territory of Russia of weapons, military equipment and military property en route to the International Security Assistance Force in the Islamic Republic of Afghanistan and in the reverse direction."